Welcome to Day #1 of the Beauty and the Beak Blog Tour! To celebrate the release of Beauty and the Beak by Deborah Lee Rose and Janie VeltKamp (8/27/17), blogs across the web are featuring exclusive content from Deborah, plus 5 chances to win a copy of Beauty and the Beak! People often say to "write what you know," but I tell students "write what you can learn." I knew almost nothing about bald eagles when I started researching Beauty and the Beak. I searched out information everywhere I could—from books, documentaries, and articles online, and by visiting a nearby wildlife center where I watched trained staff handling live birds of prey as Janie does. Most important of all, I spent countless hours on the phone with Janie, learning from her about her experiences with Beauty, and about bald eagles. Her encyclopedic knowledge helped me tell Beauty and Janie's story in Beauty and the Beak as if I had been there while it was unfolding. My talks and emails with Janie also helped us capture the story of bald eagles as a raptor species that was almost wiped out on the U.S. mainland. My most unexpected research experience was seeing a wild bald eagle in flight for the first time in my life, at a reservoir not far from my home! 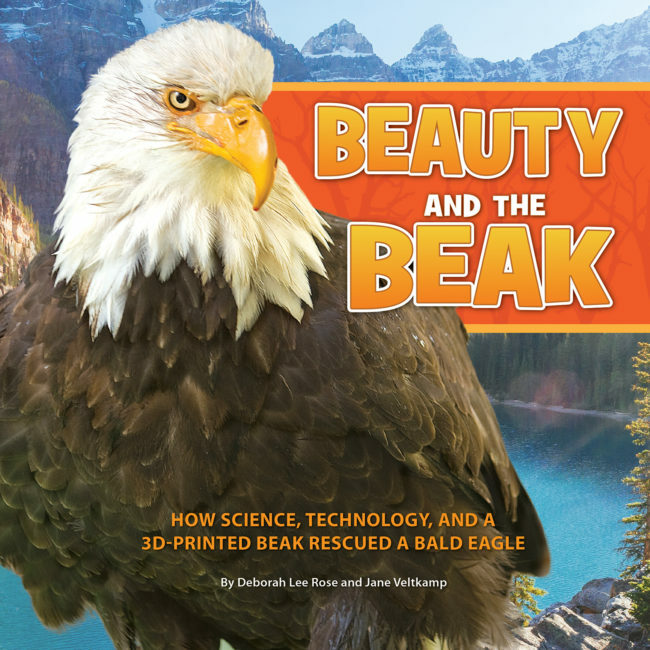 BEAUTY AND THE BEAK is a new, nonfiction picture book about Beauty, the wild bald eagle that made world news when she was illegally shot, rescued, and received a pioneering, 3D-printed prosthetic beak. BEAUTY AND THE BEAK follows Beauty close up from the moment she uses her baby beak to emerge from her egg, through her hunt when she uses her powerful adult beak to feed herself, to the day her beak is shot off leaving her helpless. This brave and heartlifting story continues through her rescue, into the months of engineering her 3D-printed prosthetic beak and intense hours of her beak surgery, to the moment she takes the first drink of water by herself with her new beak. BEAUTY AND THE BEAK captures the spirit and courage of this amazing bird and America’s national symbol―whose species was nearly wiped out by human activity, only to be restored and thriving because of environmental conservation and human compassion. This book will resonate with stories of other animals endangered or in need, and with stories of humans, from young children to military veterans, in need of prosthetic limbs, who are being given new lives with state-of-the-art devices. The book includes expanded information about bald eagles as a top predator species, their near extinction in most of the U.S., their successful reintroduction back into the wild, and efforts to conserve this critical raptor species today. 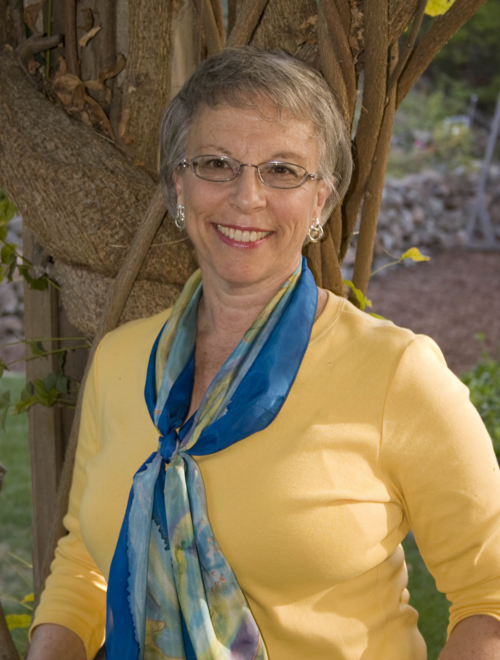 About the Authors: Deborah Lee Rose is an internationally published, award-winning author of many beloved children’s books. Jimmy the Joey: The True Story of an Amazing Koala Rescue is a Reading is Fundamental/Macy’s Multicultural Collection title and Notable Social Studies Trade Book for Students K-12. Into the A, B, Sea was named to the New York Public Library’s 100 Titles for Reading and Sharing. Deborah helped create and directed communications for the ALA/AASL award-winning national STEM education website Howtosmile.org, and helped created STEM activity apps for Lawrence Hall of Science which have been downloaded more than one million times. She also served as Director of Communications for Lindsay Wildlife Experience, which includes one of the first wildlife rehabilitation hospitals established in the U.S. Deborah lives in Walnut Creek, CA, and speaks at book events, conferences, schools and libraries across the country. Visit her website at deborahleerose.com. Jane Veltkamp is a raptor biologist and rehabilitator, wildlife educator, trained nurse, and master falconer. 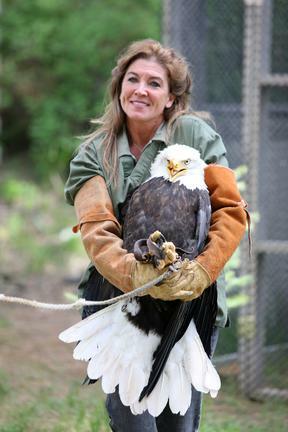 She led the team who developed Beauty the Bald Eagle’s prosthetic beak and has lifetime care of Beauty. Jane is founder and executive director of Birds of Prey Northwest, in Idaho, a raptor center which educates the public about raptor conservation, including through live raptor programs, and has provided medical treatment and rehabilitation to thousands of injured birds of prey to return them to the wild. She spent ten years of her career reintroducing ospreys and peregrine falcons to regions where they had disappeared from their habitat in South Dakota and Indiana. She rescues and cares for Bald Eagles, including Beauty, by permit from the U.S. Fish and Wildlife Service. Jane lives near Coeur d'Alene, Idaho, and is also the eagle expert for the Coeur d'Alene Tribe's Native American Aviaries. Visit her website at birdsofpreynorthwest.org. About the Persnickety Press: Persnickety Press is the sister imprint of the Cornell Lab Publishing Group. Persnickety publishes a broad range of books for children and young adults, both fiction and nonfiction, from picture books through teen titles. Our books focus on empowerment, showing young people that what they do matters, what they care about is worthy of their attention and dedication, and even as children, they can make a real difference. I have a book that students read in guided reading groups about Beauty and they are fascinated by her story. I definitely have to look for this book.